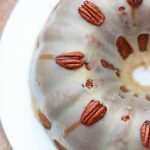 This delicious pumpkin pecan cake is glazed with a sugar bourbon glaze and garnished with sugared pecans. 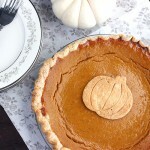 Perfect substitute for pumpkin pie! I will pretty much try any recipe with bourbon in it. Maybe it’s the Southern girl in me. 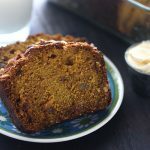 The good thing about this pumpkin pecan cake is that it was delicious. The pumpkin kept it moist. I could have eaten the glaze warm from the stove with a spoon. Okay, maybe not could have – I did. The bad thing about this cake was that there were a lot of parts that had to come together. However, the pecans can be made up to a week in advance and the cake up to two days in advance. I recommend starting with the candied pecans first. Get them done and cooled. It’s REALLY easy. Step two. While the oven is preheating, combine some brown sugar, honey and a tablespoon of water in a small saucepan. Heat until the sugar is dissolved and the mixture start to thicken just a bit. Step three. Add the pecans to the saucepan and stir them around until they are all nice and coated with that glaze. Step four. Spread them out on a lightly greased and foil lined baking sheet. Spread the pecans around in a single layer, curved side up. Bake for 10 minutes. Once you’ve removed from the oven, immediately remove them from the pan to a sheet of parchment paper or another sheet of foil to start cooling. Step one. If you’re going straight into the cake-making after you’ve finished the pecans, keep that oven set on 350 degrees. You also want to grease a bundt or tube pan. We also need four eggs at room temperature, so go ahead and set those out too. Step two. In a large mixing bowl, combine flour, baking powder, ginger, cinnamon, salt, baking soda, nutmeg, and ground cloves. Step three. In a separate bowl, whisk together buttermilk, bourbon, and vanilla. Don’t go out and buy the most expensive bourbon you can find. Save those for sipping. For baking, Jim Beam, Wild Turkey, Old Crow, or Heaven Hill is the way to go. Step four. Set your bowls with the wet and dry ingredients aside. Next, beat butter at medium speed using an electric mixture until it’s creamy. Slowly drizzle in some vegetable oil and continue to mix until it’s combined. Add brown sugar, then increase speed to high and continue to beat – scraping the sides of the bowl as needed – until the mixture is fluffy. This should take around four minutes. Step five. Add the eggs, one at a time. Mix the batter thoroughly before you add the next egg. Add the canned pumpkin and continue to mix until everything is combined. Step six. Turn the mixer speed down to low. Slowly pour in your wet ingredients. After that is all mixed in, add dry ingredients – one-third at a time- scraping the sides of the bowl in between each addition. You may have to turn the mixer off for a couple of seconds when you do this. Continue to mix just until dry ingredients are incorporated. Don’t overmix or you could end up with a tough cake. Step seven. Pour the batter into your greased cake pan. Smooth out the top, then gently tap the pan on the counter to get rid of any air bubbles that may have formed within your batter. Step eight. Bake for 45 minutes, then test to see if it’s done by sticking a toothpick in near the center of the cake. If the toothpick comes out clean — your good! If it comes out with some dough on it, put it back into the oven for another 10 minutes and try again. Allow the cake to cool in the pan for about 15 minutes. Then run a knife around the sides of the pan. Carefully invert the pan onto a cooling rack, and ever so gently remove the cake from the pan. If it doesn’t come out perfect, don’t beat yourself up. 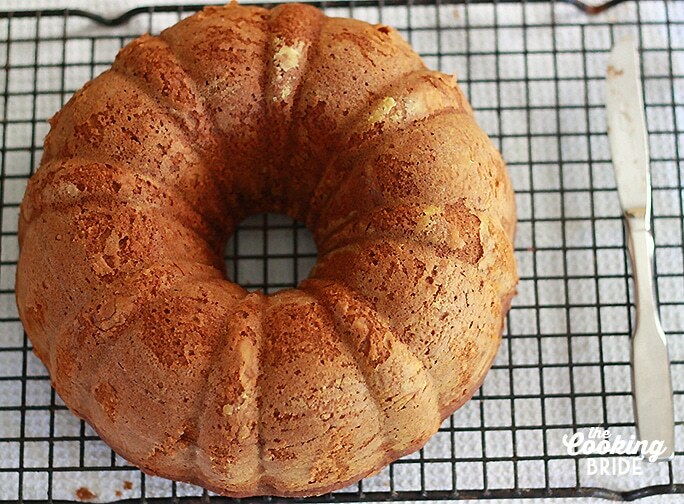 Bundt pans are notoriously hard to deal with. Remember, you’re topping everything with a glaze in a minute. It will hide any imperfections or mishaps that may have occurred when you tried to remove the pan. Now that we’ve got out pecans candied and our cake baked and cooled, we want to start on the glaze. The bourbon in this glaze does not create a boozy taste at all. In fact, it creates a hint of maple flavor. Step one. Start by combining some brown sugar, butter, corn syrup, bourbon, and salt in a medium saucepan. Bring to a boil over medium heat and continue to boil until sugar is completely dissolved. This will take about 2 minutes. Step two. Add some cream and increase heat to high. Bring to a boil and cook for 1 minute, stirring occasionally. Remove the pan from the heat. Whisk in confectioners’ (aka powdered) sugar and vanilla until the glaze is smooth. Let glaze stand for about five minutes to continue to thicken up. Step three. Drizzle the warm glaze over the top of the cake. As it cools it will take on that pretty pearlescent sheen you see in the pictures. While the glaze is still warm, arrange the candied pecans around the perimeter. Step four. At this point, I know you are anxious to cut yourself a big ol’ slice. But, you need let the glaze set for 15 minutes before serving. If you aren’t a pumpkin pie fan, this cake would make a great substitution for a holiday meal. 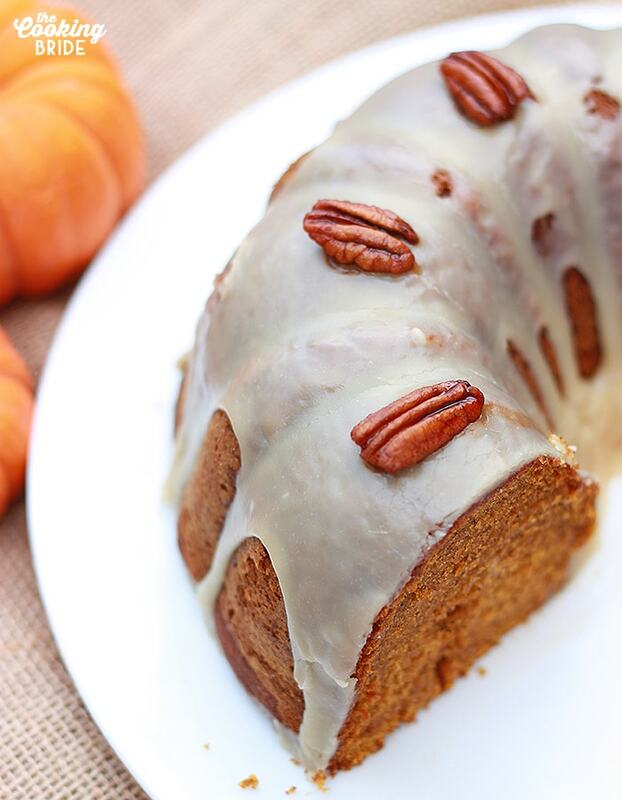 This delicious pumpkin pecan cake is glazed with a sugar bourbon glaze and garnished with sugared pecans. Perfect Thanksgiving substitute for pumpkin pie! Preheat oven to 350 degrees. Grease and flour and 10- to 12-cup tube or bundt pan. In a large mixing bowl, sift together flour, baking powder, ginger, cinnamon, salt, baking soda, nutmeg, and cloves. In a separate bowl, mix together buttermilk, bourbon, and vanilla. Using an electric mixer (if using a stand mixer, fit with paddle attachment), beat butter at medium speed until creamy. Drizzle in the oil and continue to mix until combined. Add the brown sugar, then increase speed to high and continue to beat – scraping the sides of the bowl as needed - until mixture is fluffy, about 4 minutes. Add the eggs, one at a time, mixing thoroughly between each addition. Add pumpkin and continue to mix until combined. Reduce mixer speed to low and slowly pour in buttermilk mixture. Once the buttermilk mixture is incorporated, add dry ingredients - one-third at a time- scraping the sides of the bowl in between each addition. Continue to mix just until dry ingredients are incorporated. Pour batter into your prepared pan. Smooth the top and then tap pan on the counter a couple of times to release any air bubbles. Bake cake for 45-55 minutes or until a wooden skewer inserted near the center comes out clean. Allow cake to cool in pan for 15 minutes. Run a knife around the perimeter of the pan, then invert pan onto a rack. Hopefully – God willing – your cake will pop right out. Let cake continue to cool for at least 3 hours. In a small saucepan over medium heat, combine brown sugar, honey, and 1 tablespoon of water. Add the pecans and stir until the pecans are coated. Spread pecans out in a single layer, curved side up, on a greased baking sheet. Bake for 10 minutes. Immediately transfer pecans to a sheet of parchment paper to cool, about 20 minutes. In a medium saucepan, combine brown sugar, butter, corn syrup, bourbon, and salt. Bring to a boil over medium heat and continue to boil until sugar is completely dissolved, about 2 minutes. Add cream and increase heat to high. Bring to a boil and cook for 1 minute, stirring occasionally. Remove pan from heat. Whisk in confectioners’ sugar and vanilla until glaze is smooth. Let glaze stand until thickened, about five minutes. Drizzle warm glaze over the cake. 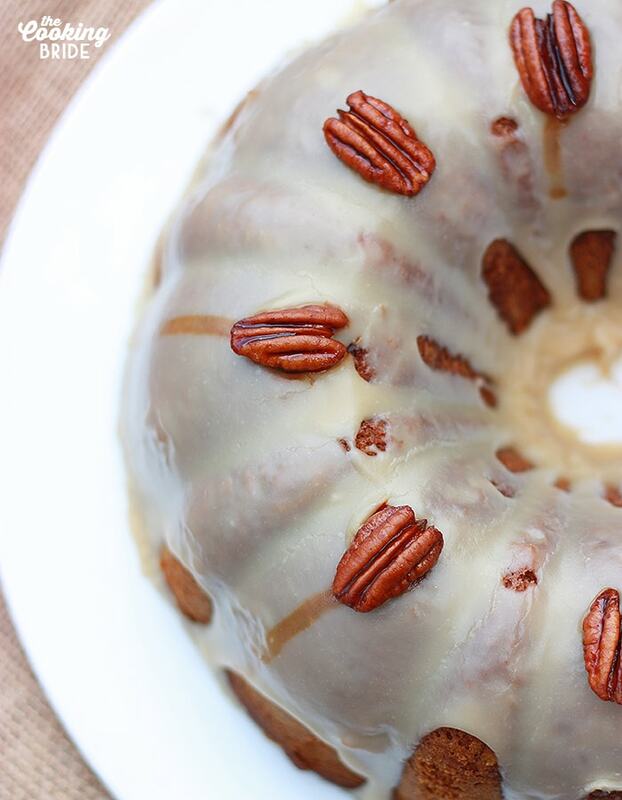 Arrange candied pecans over the top of the glazed cake. Allow glaze to set for 15 minutes before serving. 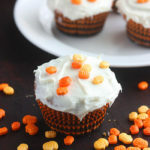 The pumpkin/bourbon combo is not one to be missed! This cake looks perfect in so many ways…worth the stress of all the components. Such a pretty pumpkin cake! Lovely and very seasonal dessert! This looks delicious! Putting it on my list of things to make! Beautiful website btw. Thank you Samantha! Let me know how it turns out! I am totally with you. I will try anything with bourbon and I’m not even a Southern girl! This cake looks delicious, pretty and perfect for fall! It’s going on my “to make” list! Oh wow! Pumpkin and pecans are some of my favorites and with buttermilk! Can’t wait to make this! 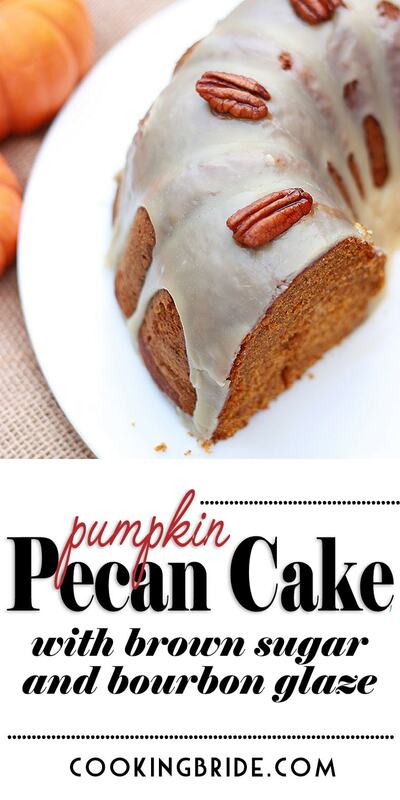 This pumpkin pecan cake sounds absolutely perfect for the holidays! Love a good bundt cake! This bourbon glaze looks to die for! Bring on alllll the pumpkin! This is absolutely perfect for the upcoming holidays! That bourbon glaze is amazing! Beautiful cake! What a delightful cake! Perfect for the holidays! Thanks for sharing!